They say the ancient Egyptians worshipped cats. I wonder what future humans will say about us when they examine our Internet servers! We all know cats are popular. But, as I found out the other day, they can even help you get more email subscribers, brand loyalty and trust. I’m not talking about posting cat pictures on your entirely unrelated business or health blog though. That would be mental. 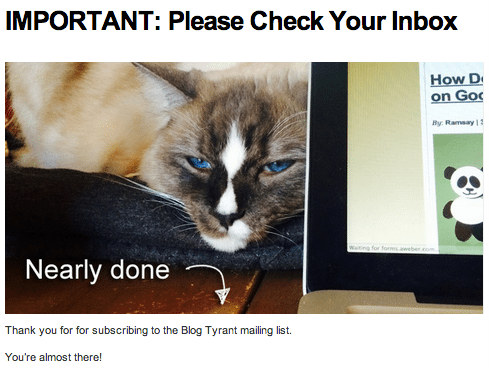 But I literally did use some images of my cat on Blog Tyrant to boost my email subscriber rate. NOTE: This post contains some affiliate links. If you purchase a package by clicking from this page I’ll earn a small commission at no extra cost to you. Thanks for supporting the site. So I was sitting with my beautiful fiancée (who is also in the marketing field) mucking around on Blog Tyrant trying to create a new landing page for an upcoming advertising campaign. 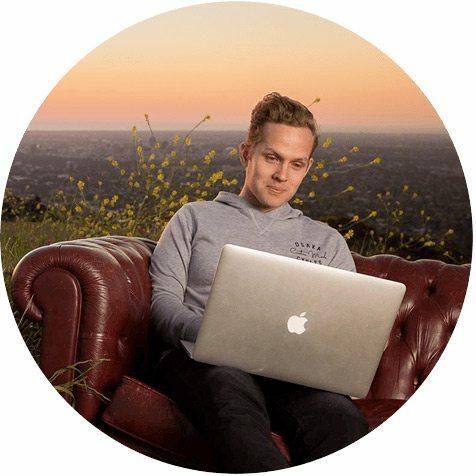 Checking my email subscriber stats I discovered that a large portion of email subscribers weren’t confirming their email address – a very important step in the double opt-in process. 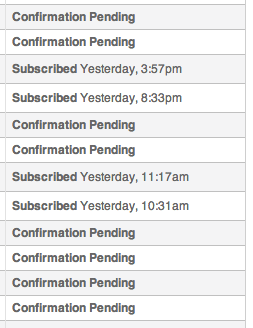 The above is a screenshot from my AWeber account showing a huge block of recent subscribers who signed up and then didn’t confirm their email address. Now, there are some people who have been saying lately that AWeber mail outs are getting delivered to the spam folder a lot more. I don’t know if this is true but I can assure you I am looking into it very seriously as the majority of my business (other than the blog) is done via email marketing. Up until now I had just used AWeber’s default page that asks people to confirm. I had always assumed that it did the trick even though it was unbranded and looked nothing like my blog. Well, last week I created a custom thank you page which people get re-directed to as soon as they enter their email address into a form on my blog. As you can see, it uses a picture of my cat to grab attention and keep the new subscriber on my site. It then uses an arrow and some text to explain to people that they need to confirm their email address and, importantly, that the email in question may go to their spam folder. I’m starting to see a lot more people confirm their email address right away. That means more people actively on my list, receiving my Follow Up sequence and receiving notifications about new posts like this one. How do you make a custom confirmation page? If you use a service like AWeber it should be pretty easy. First, just make a Page in WordPress like mine that explains what email subscribers need to do. Then, in AWeber you just click on the sign up form that you want to edit and then under the second step in the editor field just find the section below. Select the Custom option and then paste in the URL of the page you want people to see once they’ve entered their email. NOTE: This is a different page to the “Success” page that people see after they have confirmed their email address. This one comes before. Too early to be sure? I only did this little experiment last week so it is perhaps too early to tell if the increase in confirmations is entirely due to the new confirmation page. For example, it could be that I have a different type of traffic this week and that those subscribers are more adept at finding the confirmation email. I still like to share these things with you though because I believe that it’s much better for you to try it out on your own blog than waiting to see whether it works for me. And by publishing ideas like this I can get feedback from you on the process as well as any other similar idea that you might have had. This is what makes the Tyrant Troops community so valuable – the comment threads are always filled with amazing ideas, test results and conversation. So I’ll keep publishing half-baked experiments! This type of thing really reminds me of how important it is to keep online processes simple. A lot of people who read your blog are entirely new to the concept and things like email subscriptions can seem daunting. Even companies like Amazon are struggling to simplify their process to keep shopping cat abandonment down. Make sure you explain the process clearly to potential subscribers so they know what to expect. As I found out, keeping the branding the same can help people to realize that they’re on the same site and just following the regular process. At the bottom of my emails I now have a little reminder that tells people that they’re receiving this email because they subscribed to Blog Tyrant. I borrowed this from Jon Morrow and it seems to be a good way to stop people hitting the spam button because they’re forgotten. We spend a lot of time writing really high quality content, working on SEO and crafting the perfect emails. It’s super important, therefore, to make sure we’re not wasting all that hard working by having gaps in the sign up process. Have you had a problem getting people to confirm their email address when they subscribe to your blog? What did you do about it? If you have any stories or perhaps and other ideas about this I’d love to hear from you. All photos by Ramsay who spends way too much time alone talking to his cat. Okay, I already followed, but I had to start following you on Instagram because of the cat photos, very cute. Ha ha. He is awesome! Ha ha ha. The net sure loves cats. Brilliant! I have plenty of photos of my cat I could use. Ha ha. I feel like I might start a “cats on unrelated blogs” movement. Just imagine if you shared Cino (if my memory serves me correctly) on Floppycats.com as Ragdoll of the Week – all those wannabe cat bloggers would have someone new to follow for tips and tricks. Of course, I think this idea is brilliant – any Ragdoll cat with eyes like that and a blaze like that will attract attention and demand sign ups. Oh yeah I totally forgot I was going to do that! Let me look at it now. Sorry Ramsay, If I wasn’t an already loyal reader if yours and I saw your pic of your cat I would out right reject it for the plain fact there was a cat. Not everyone likes pictures of cats. I feel there is way too many pictures of those dastardly felines. 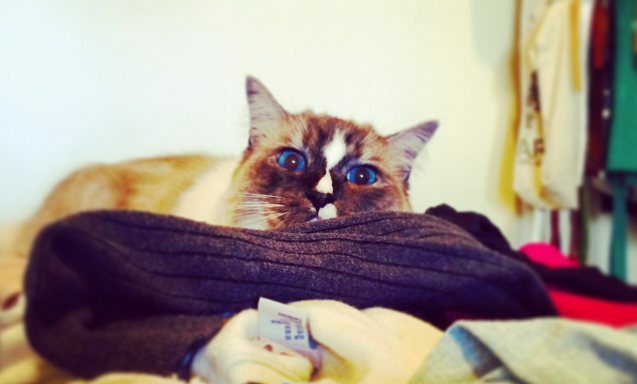 I even have a Pinterest board called “I hate cats!” Lol but other than that, great post! You take down that board right now! Ha ha. Great Post Ramsay! I noticed when I get your email newsletter that it shows your first and last name. Is it better to show your name or to show your brand’s name? I was planning to test that. It used to say Blog Tyrant but now I’m testing my real name. Open rates seem to be slightly up but it’s still too early to tell. Most of the big names Glen Allsopp, Jon Morrow, Pat Flynn, etc. all use their names. Okay I thought it used to say BlogTyrant. Thanks for the response. I would never in a million years thought of sending an aWeber request for confirmation with pictures of cats and I’m amazed that it seemed to work for you. I wonder how many sign-ups decided to not confirm because of the cat photos. I think it’s more about making it seem familiar and friendly than anything to do with the cats. I think I will have to buy one cat for increasing my conversion.. ha ha..
Another awesome article with complete action plan. I was thinking to add custom confirmation page on my blog as well but due to heavy work load I was not able to do it. This article for sure going to force me to take action today itself. Ha ha. Glad you enjoyed. I use Mailchimp for my mailing list. Though I kind of focus my content on helping Nigerians blog with excellence, I would like to know if I can customize my signup process in Mailchimp like that too (not with cats though, ha ha ha). I tried creating a new page for the sign up in my WordPress dashboard, the page seems to be appearing on the Menu, how do I hide that to show only for Subscriptions? You have schooled me in blogging. Keep it up! Find a plugin called “exclude from navigation”. Ha ha ha. Bearly contained myself with that comment. I am going through my subscription messages now – just changed from Mailchimp to Aweber. I would have thought that emails with images in them would decrease sign up rate – good to hear its helping you out. I think it adds personality and that can only be a good thing. Sorry my bad 🙂 – didn’t realise it was on the subscription confirmation page. Makes more sense now, and I think personalizing that page in a way that is congruent with your style / blog would be beneficial for people to follow through. It would grab attention and show some personality – I am playing around with the concept myself but through a personal message, I hadn’t thought to use any images. Love your cat – very very beautiful. My gravatar is a pic of me and my Coco dog. It’s an image I have on my Linked In profile and people love it. One of my most popular posts was 30 things I learnt about life from my dog! I’m turning that post into a slideshow! I agree that it gives people a glimpse into the person behind the brand and I love my Coco dog. By the way – I got a customer to my Life Dreaming from this fab blog. Cool people follow the Blog Tyrant. Have a great week Ramsay. just saw that my gravatar is my LD logo. Coco dog and me are on other social media though! Glad you got a customer from here! That’s awesome! I have been using AWeber for a few years and I’m very happy with their service, but I had a similar experience with delivery a few months ago. I started a new list with a new site and the confirmation emails weren’t being delivered. They weren’t going to the spam folder like yours are, but they just weren’t being delivered at all. AWeber support tried to help me with it, but their suggestions weren’t working. I tried GetResponse with the same email address, subject line, and email body message, and I’ve had no problems with the delivery. I still use AWeber with one of my other sites and I don’t have any issues with that account, so I’m not anti-AWeber. But if you are having trouble keeping emails out of the spam folder you may want to do some testing with a free trial at GetResponse. A few people have been telling me this. I’m thinking about doing a test for the next mailout. I love this idea! I’m currently working on a niche blog and this is so genius, it blew my mind. I didn’t like the blog at all, so I didn’t re-subscribe, but this was just genius to me. So simple, yet very impactful! Ha ha. Poor Bob! There are some funny error pages out there as well. Thanks for sharing Wendy, that’s awesome. An email has been dispatched to your inbox. You MUST click the link in that email to confirm your email address. Once they click the confirmation link, it takes them to a Thank You page. If anyone is using Mailchimp, the settings are under your list’s form options. *This entire comment contains no deep insight, no gold nuggets of information, and no cat pictures. Meow. Thanks for mentioning the change to my real name. I was hoping it would have that effect. Appreciate the feedback. Great blog article Ramsay! As someone who is just getting going building my list I want to make sure no new followers fall into this “crack.” Fol lowering your advice I already set up my aweber acct so this should be easy to make the needed adjustments with. Love it! You wrote ‘shopping CAT abandonment’ instead of cart. YES! Someone read the post! Ramsay, I am blown away that you are just now utilizing custom landing pages for email sign up. For those of us who do not use Aweber, we can also create a custom landing page on our site, and then, depending on the provider, link to it as the second step of the sign up process, which will take care of branding, since the page is hosted on our site (inside the template we use). Yeah I have them at every other stage but just not that instant “confirm your email” page. Never thought it made a difference.